The HumDT Series transceiver is designed for the reliable wireless transfer of serial digital data. It consists of a highly optimized RF transceiver and integrated data and networking protocol. A frequency agile over-the-air protocol provides better link reliability than narrowband solutions while providing faster synchronization and data output than Frequency Hopping Spread Spectrum (FHSS) algorithms. The frequency agile protocol sends the same data on up to 4 channels, providing the noise immunity benefits of FHSS without the overhead of a hopping protocol. A serial command selects the number of channels as well as which specific channels are used. Versions are available in the 902 to 928MHz and 2,400 to 2,483MHz frequency bands. The 900MHz version can achieve a line-of-sight range of up to 1,600m (1.0 mile). The 2.4GHz version can achieve a line-of-sight range of 100m (300 feet). The final range may be less depending on the regulatory requirements in the country of operation. The module's UART interface is used for module configuration and data transfer. 8 GPIOs can be used for analog and digital functions and are controlled through the UART. 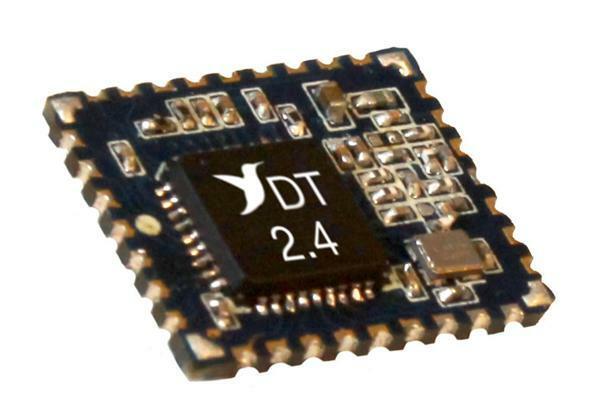 Housed in a compact reflow-compatible SMD package, the transceiver requires no external RF components except an antenna, which greatly simplifies integration and lowers assembly costs.